A 3 part system with snow and ice changing to rain through Tuesday. 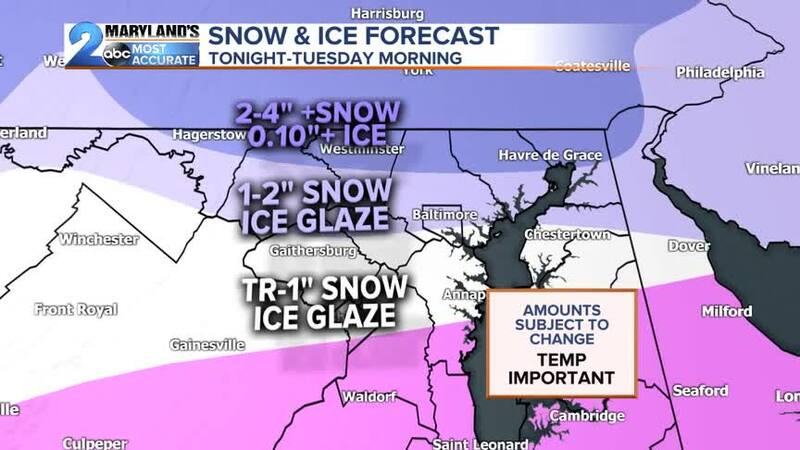 A "Double Wintry Whammy" for Central Maryland to start out the workweek. Winter Weather Advisories have been issued for Cecil Kent, Caroline, Harford, Howard, Anne Arundel, Carroll, Baltimore, Frederick, Washington, Allegany, and Garrett counties from now though 10am Monday morning. An area of low pressure along with a weak front lifting north will put down a quick dusting to 2" of snow that should wrap up after the Monday morning rush. Winter Storm Watches kick in shortly after that from 4pm Monday afternoon through 10am Tuesday morning for northern Baltimore, Harford, Carroll, and Frederick counties. Snow accumulations will be on the order of 2-4" with a heavy glaze of ice expected. Our first wave of wintry weather moves into the Baltimore metro area after 9pm Sunday and continues through 10am Monday. Temperatures will sit at or slightly below freezing making for an all snow situation. As it stands now the morning rush will be slick especially the further north and west of the city where the snow looks to linger a little longer. There will be a lull in the action late Monday morning into the mid afternoon as the next area of low pressure approaches from the west. Precipitation will start to fill in from the south and west. As this occurs another area of low pressure will shift to the coast driving down colder air creating the concern for heavy snow north and freezing rain south of the city. The mixed precipitation picks up in intensity between 7pm-12am Tuesday before temperatures slowly warm by late Tuesday morning as the system departs. This will be a HIGH impact event for travel since ICING looks to be a big time concern. Even out along the Eastern Shore from US-50 to US-301 slippery travel conditions are likely at the onset before the changeover to rain. Snow totals with this storm are a bit of a challenge with this system based upon temperatures and mixing which creates compaction . Areas such as Carroll, northern Baltimore, northern Harford, and Frederick counties will see the heaviest amounts of snow with localized spots of 4"+. Further south in Baltimore and along I-95 a quick coating to 2" of snow is likely before the changeover to sleet and freezing rain. Tricky travel will be widespread even on treated surfaces since ice will be an issue. Plan accordingly for slick travel concerns as anything that is snow/liquid will freeze immediately especially on those elevated surfaces. Road conditions won't improve much until we get to late Tuesday morning with temperatures climbing back above 32 degrees. First round of snow moves in now through 9am Monday. Second round of snow 6pm Monday-12am Tuesday. Road conditions are likely to be impacted fairly quickly as temperatures hover around 27-32 degrees during the duration of the event. Areas around South Mountain and along US-15 toward the Catochtins could see snow amounts around 4"+. US-340 toward Boonsboro/Brunswick and I-70 West Hancock/Sideling Hill likely to see 2-4" amounts as well due to extra lift from the mountains. A heavy glaze of ice is also possible with ice amounts of 0.10"-0.20"+ Monday afternoon-Tuesday morning. Slippery roads are likely especially on elevated surfaces such as I-83 from the City north to Parkton. Problems are also likely to occur north of MD 136, MD 152, and the PA/MD line even with amounts there around 2-4"+. Slippery roads are likely especially on elevated surfaces such as I-83, I-97, I-695, US- 301, and I-95 from Canton to Glen Burnie/Columbia. Problems are also likely to occur north of MD 29 and MD 32 back toward Mount Airy with amounts there around 1-2". Most areas like Towson, Hampden, Middle River, Essex, Columbia, Catonsville, Ellicott City, West Friendship, White Marsh, & Middle River are looking at Dusting-2" of snow. A light glaze of ice is also expected in these areas creating additional travel concern. Precipitation will start with a snow before changing to snow/sleet late tonight. Light snow will last through Monday morning rush with a dusting-1" expected. Phase 2 of the storm starts as rain and freezing rain over to sleet back to freezing rain between 6pm Monday-12am Tuesday. The changeover to all rain occurs during the overnight into early Tuesday morning as temperatures sit 33-36 degrees. Slick travel is likely on US-50 and I-295 south with a light glaze of ice expected here. Snow amounts upwards of 2-4" likely with significant icing concerns. Those areas above 2,500 ft such as Keysers Ridge, Big Savage Mountain and Oakland could see the ice amounts closer to 0.5". Snow covered roads and dangerous travel concerns as temperatures hang out around 28-32 degrees. Power outage issues likely. Our storm system departs pretty quickly Tuesday evening leaving in it's wake a Valentine's Day Warm-up. A taste of Spring is even on the way with highs by Thursday and Friday in the low to mid 50s.